This study investigates the effect of interactive-image elaboration on the acquisition of English vocabulary by Arabic speakers. Three ESL classes at a technical college were divided into three groups and for each one a different procedure was used. The first procedure provides ready-made interactive pictures while the procedure in the second group was to ask participants to generate their own imagery pictures or to use the repetition strategy while the third treatment required students to use the strategy of repetition to learn the meaning of the new words, both in immediate and delayed tests (two weeks later). Tests of immediate and delayed results suggest that the use of the ready-made interactive pictures’ strategy increased retention above the other strategies. Furthermore, the tests results also suggest that using elaborative devices either spontaneously or by design is more effective than the repetition strategy and it is possible for such a strategy to be adopted in natural classroom settings. Harley, B. (Ed.). (1995). Lexical issues in language learning. Ann Arbor, MI: Research Club in Language Learning. Hell, J. and Mahn, A. (1997). 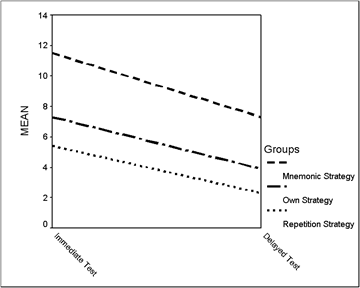 ‘Keyword Mnemonic Versus Rote Rehearsal: Learning Concrete and Abstract Foreign Words by Experienced and Inexperienced Learners’. Language Learning. 47, 3: 507-546. Nation, P. (1993). Vocabulary size, growth, and use. In R. Schreuder and B. Weltens (eds) The Bilingual Lexicon (pp. 115-134). Amsterdam: John Benjamins. Ellis, N. C. (1995). The psychology of foreign language vocabulary acquisition: Implications for CALL’. Computer Assisted Language Learning, 8(2-3), 103-128. Bellezza, E S. (1981). ‘Mnemonic devices: Classification, characteristics and criteria.’ Review of Educational Research, 51, 247-275. Wang, A. & Thomas, M. (1992). ‘The Effect of Imagery-Based Mnemonics on The Long-Term Retention of Chinese Character’. Language Learning. 42, 3: 359-376. Thompson, G. (1987). ‘Using Bilingual Dictionaries’. ELT Journal. 41, 282-286. Sokmen, A. (1997). Current trends in teaching second language vocabulary. In Schmitt, N & McCarthy M. (Eds. ), Vocabulary: Description, acquisition and pedagogy (pp. 237-257). Cambridge: Cambridge University Press. Nattinger, J. (1988). “Some Current Trends in Vocabulary Teaching” in Carter, R. and McCarthy, M. Vocabulary and Language Teaching, London: Longman, pp. 62-82. Curran, C. A. (1976). Counseling-learning in second-language learning. East Dubuque, IL: Counseling Learning Publications. Atkinson, R. C. (1975). “Mnemotechnics in Second-Language Learning”. American Psychologist. 30: 821-38. Gu, Y. (2003a). ‘Vocabulary Learning in a Second Language: Person, Task, Context and Strategies.’ TESL-EJ. 7,2:1-26. Avila, A. and Sadoski, M. (1996). ‘Exploring New Application of The Keyword Method to Acquire English Vocabulary’. Language Learning. 46, 3: 379-395. Rodriguez, M. and Sadoski, M. (2000). ‘Effects of Rote, Context, Keyword, and Context/ Keyword Methods on Retention of Vocabulary in EFL Classrooms.’ Language Learning, 50, 2: 385- 412. AlQahtani, M. (2005). The Use of Vocabulary learning Strategies by EFL Learners at Three Different Educational Levels, University of Essex: Unpublished PhD Thesis. Brown T.S.& Perry, F.L. (1991). ‘A comparison of three learning strategies for ESL vocabulary acquisition’. TESOL Quarterly, 25, 4: 65-670. Ott, E. C., Butler, D.C., Blake, R.S. & Ball, J.P. (1973). ‘The effect of Interactive Image Elaboration on The Acquisition of Foreign Language Vocabulary’. Language Learning. 23: 197-206. Cohen, A. D. (1987). ‘The use of verbal and imagery mnemonics in second-language vocabulary learning’. Studies in Second Language Acquisition. 9, 43-62. Fogg, B.J, Persuasive technology: using computers to change what we think and do, Morgan Kaufmann Publishers, Boston, 2003, 30-35.